Update! Please please share and call, write to end the mass squirrel slaughter for prizes in NY! You won't believe it! Subject: Update! Please please share and call, write to end the mass squirrel slaughter for prizes in NY! You won't believe it! 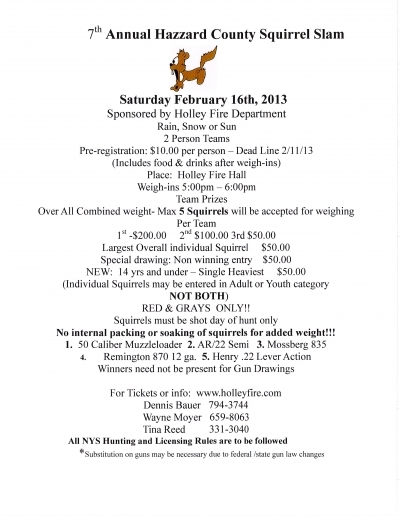 Official statement from Holley Fire Department ~ regarding Squirrel massacre...You won't believe it!!!!!!!!!!! SHAME! SHAME! SHAME! Please continue to call and write!!!! I am trying to calm down. The idiocy is impossible to even put into words. We can't have fund raisers without killing????? Respect their rights??? What about the rights of the squirrels to live and what about teaching children compassion??? Don't they have that right? The Holley Fire Department supports the freedoms and rights of our citizens, protected by the government. Our upcoming fundraiser has been in place for multiple years. We are diligent in making sure that all laws set by the State of New York are adhered to. Participants are licensed and are limited to the regulations of the state. While we respect the opinions of the public, there are multiple opinions to every situation. As representatives of government, we have taken the opportunity to listen to all sides of this event and will continue to do so. This event has shown to be successful for many years without a negative outcome to our community. Members of the community use the game gathered for food and for their pelts. Proceeds raised by the event are used to support the life and property saving efforts of the fire department. The department has decided to proceed with our scheduled derby and raffle February 16. The Fire Company also hopes that citizens respect the freedoms and rights of those who choose to participate and support this event. re: Please, please share and write to end the mass squirrel slaughter for prizes in NY! See letters and comments below! I just wrote to the fire department and Mayor John W. Kenney Jr. In a barrel for a fundraiser! For the poor neglected, mistreated animals in our country. Going on for 6 years running! Insane. Here is the actual AD for the squirrel hunt. Your decision and justification for this event are beyond belief! Compassionate and caring people around the world have seen this as an example of out of touch Neanderthals who still thinking that killing living beings, because they are helpless animals, is OK! SHAME! SHAME! SHAME! Times have changed, the world is evolving and clearly, senseless killing is off the table, or don't you follow the news? And what a disingenuous response to justify your hideous slaughter! "Members of the community use the game gathered for food and for their pelts." Who in their right mind eats squirrels these days? and wears their pelts???? Stupid is as stupid does! It's time to evolve! I am shocked and appalled by your Fire Department's recent decision to continue with plans for the upcoming squirrel shoot. As a teacher in New York City, I try to teach my students that life is precious, something to be revered. This is not the lesson to be learned at this event. There is currently an epidemic of violence in this country. I fear that in light of the recent controversy over gun control laws, your Fire Department's reluctance to change their minds and cancel the event despite massive public protest over its insensitivity and cruelty, is simply a knee-jerk reaction to attempts modify our "gun culture." Please do not take your political quarrels out on sentient animals who are causing no harm to you. Including children in this event is especially gruesome. They need to be taught compassion for others, not that life is cheap and killing is fun. Why not turn this around and present a more positive event instead - one where no one ends up dead? Reversing your decision would be good publicity for Holley and simply the right thing to do. Subject: Please please share and write to end the mass squirrel slaughter for prizes in NY! You are receiving this email because you have either requested to be added to our list or indicated at some time in the past that you were interested in animal advocacy/rescue issues. You may unsubscribe at any time if you no longer wish to receive our emails by simply hitting "Reply" and putting "UNSUBSCRIBE" in the subject line. Your name will be IMMEDIATELY removed, no questions asked. Kindly be considerate of the animals we are trying to save. Never mark our messages as spam. ~SOS: Save Our Shelter Animals: Like us on facebook! Please please share and write to end the mass squirrel slaughter for prizes in NY! LOOSERS!!!!!!!!! The Holley New York Fire Department is holding a squirrel killing contest known as ‘Squirrel Slam’, a competition for children and their parents to senselessly shoot squirrels. Cash prizes will be awarded for… the biggest dead squirrels. I called the Fire Department at (585) 638-6884 to express my disapproval. I politely explained that this is not the image children should have of a fire department and suggested that rather than holding a competition to kill animals, they should host an event to raise money to save animals since they are in the business of saving lives. I encourage you to call as well. Thank you. The event is scheduled for February 16th. There is still time to stop it. As public pressure mounts, they may reverse course and decide it is not in their best interest to kill animals. If they cancel the event, the news media will likely cover the story, which will raise awareness about the importance of showing compassion for all animals. Let’s see if we can turn this incident into a positive for animals and the Fire Department. What are you thinking? After the recent tragic events in Sandy Hook, Aurora, and so many other shootings that have stolen the lives of innocent children, and others, how could you even begin to consider that an event which is illustrative of ignorance, insensitivity and a depraved indifference to life (in this case the lives of innocent animals), would be an appropriate way to raise money for whatever cause or purpose? Studies indicate that animal cruelty is frequently a precursor and often accompanies violence toward people. It's time to wake up. As a society, we should be teaching our children compassion, concern for others and especially for the beautiful little creatures who bring so much joy into our lives, just because they are there. So many children want to grow up to be firemen, because they are our heroes. They SAVE lives! They are brave and care enough to risk their own lives. What message does a senseless massacre of squirrels send to children, who love all animals? As a teacher, I find the idea of a squirrel shoot to be appalling and antithetical to everything we teach as parents and humane educators who want children to value life, be it the life of a person or an animal. I urge you to act immediately to cancel this event. You have brought enough shame on your community as thanks to the internet, the news of this event has already circled the globe.